As facility operations become increasingly complex, MBCx is critical for maintaining expected levels of efficiency. If a life-cycle assessment is your decision-making tool during design, monitoring-based commissioning (MBCx) is the equivalent during operations. 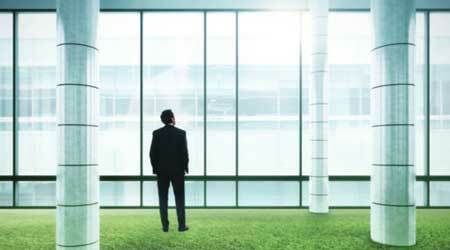 Design performance has become an increasingly important consideration for facility mangers. Most green buildings are designed according to an energy model baseline to determine potential savings. However, actual performance tends to vary significantly from these estimates due to statistical variation, unexpected changes in occupancy patterns, and other factors. To combat these inefficiencies, the commissioning process brings oversight and verification that the building will be able to meet requirements well beyond the first day of occupancy. While green building rating systems such as LEED require fundamental commissioning as a prerequisite, there are several options to go above and beyond by pursuing enhanced commissioning. The MBCx option within the Enhanced Commissioning credit of LEED version 4 provides building owners, operators, and the commissioning agents with a constant stream of information to help identify operational issues in real time. This not only saves money and reduces facility efforts, but significantly cuts energy consumption over the life of the building. MBCx is not necessarily a new development, but technological advances available in buildings today make it far more actionable now, as it relies on real time data gathered by internet-connected sensors in order to determine building performance by validation against the sequence of operations. Over recent years MBCx has been gaining traction in the industry based on the shift toward data-driven solutions. The main goals of MBCx are simple: Save energy and maintain occupant comfort. The MBCx process focuses on controls, trying to discover the cheapest solution that will produce the most successful results. 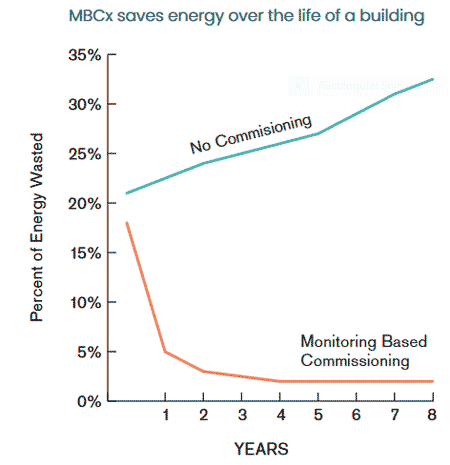 Although MBCx returns may be majority soft costs over hard costs at first, the savings are persistent over time and can bring significant value increases to a building. By ensuring all assets are maintained to meet peak performance, MBCx can help reverse the cycle of building aging and energy waste. The MBCx scope will vary depending on the type of project, especially between new versus existing spaces: New building system behavior is measured against the assumptions of an energy model, while an existing building can be compared to past performance. Regardless of the age of the building, the largest areas for opportunity are often seen in fan energy, pump energy, and compressors. Major energy reduction can be gained from incorporation of strategies such as submetering, operational points trending, and real-time analyses. By simply following fan laws and cutting speeds or adjusting the schedule of air conditioning units to widen the band of comfort, consumption can be significantly reduced. The process of MBCx requires an understanding of how building systems interact with one another. Even small systems can become complicated when they are operating simultaneously. Data gathered through MBCx allows these system interaction to be fully evaluated so that optimal parameters can be determined. Quality assurance is more commonly focused on energy than water.